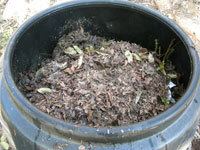 Composting transforms your kitchen scraps into a beautiful fertiliser and mulch for your garden. In an ideal world you would turn the compost to get enough oxygen to complete the transformation. However the following system creates beautiful compost without the arduous and smelly job of turning the heap. Start your new compost bin off with some compost from the previous bin if you have some. Add in kitchen scraps, often referred to as ‘greens’ in a thin layer (less than 10cm.) I collect my scraps in a 15L plastic container with a lid. For a family of four we are emptying it every 2-3 days. Throw in a handful of chicken manure pellets (dynamic lifter.) It is good to use different manures so check out the section on manures and when you have used up the chicken manure use a bag of cow manure next time. Cover with a thin layer (less than 10cm) of brown material, often referred to as ‘browns’ such as dried leaves(not eucalypts as these take too long) or dried lawn clippings. Spray with water from the hose until it runs out of the bottom of the compost bin. Keep layering until the bin is full. I collect kitchen scraps in a plastic container with a lid and every time I empty it into the compost I add in the manure and leaves. 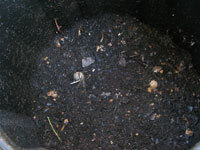 Once the bin is full it takes about 6-8 weeks to break down into usable compost. I use three bins, one that I am adding to, one that I am taking from and one that is in the process of transforming into compost. 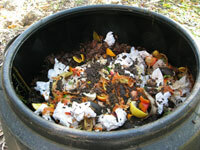 Add your scraps to the compost bin. Keep a covered container of chook pellets near your compost bin. Add your chook pellets to your compost bin. 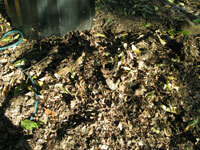 Rake your brown leaves or lawn clippings into a heap near the bin. Give it a good watering. Your compost is ready in 6-8 weeks. Composting mimics a design pattern which is a natural part of our ecosystem. The leaves fall from the tree and animals add manure which breaks down and feeds the soil. This simple cycle is what composting is all about. Collect kitchen scraps and add them to a compost or worm farm. This reduces the amount of garbage created, putting less pressure on limited landfill space. Our food waste no longer generates methane, a harmful green house gas instead it creates beautiful fertiliser and mulch for our garden. If you have a worm farm then you can collect small kitchen scraps such as carrot peels and small vegetable pieces and feed these to your worms. You will be rewarded with a steady supply of liquid fertiliser whenever it rains and worm castings, another rich fertiliser for your garden. Anything too large is collected for the compost, including onions and citrus peel that worms notoriously don’t appreciate. Meat, dairy, bones and woody plants are no good for either your worm farm or your compost. Compost is organic matter which breaks down into a rich soil-like substance that feeds your plants. Compost contains nutrients that feed the microbes in your soil. Compost increases the ability of the plant to extract nutrients from the soil. Compost can hold the equivalent of 80–90% of its weight in moisture, and therefore increases the soil’s capacity to withstand drought conditions. The biochemical structure of compost enables it to moderate – or buffer – excessive acid or alkaline soil conditions. Compost contains microbes which secrete a sticky gum-like mucilage; these contribute to the crumb structure (tilth) of the soil by holding particles together, and allowing greater aeration of the soil. Toxic substances such as heavy metals, as well as excess nutrients, can be chelated (that is, bound to the complex organic molecules of humus) and so prevented from entering the wider ecosystem. The dark colour of compost (usually black or dark brown) helps to warm up cold soils in the spring. Organic matter consists of substantial amounts of carbon (C) and lesser amounts of nitrogen (N). The balance of these two elements is called the carbon-to-nitrogen ratio (C:N ratio). The fastest way to produce fertile, sweet-smelling compost is to maintain a C:N ratio somewhere around 25 to 30 parts carbon to 1 part nitrogen, or 25-30:1. If the C:N ratio is too high (excess carbon), decomposition slows down. If the C:N ratio is too low (excess nitrogen) you will end up with a stinky pile. This totals 120 and when I divide it by the number of ingredients, in this case 4, I get 30 so I am using a 30:1 C:N ratio which is perfect for great compost! Chook manure is high in nitrogen, phosphate and calcium but low in magnesium and potassium. The higher phosphorous level can kill natives such as banksias, grevilleas and waratahs so avoid using it on them. Horse manure has less nutrients than chook manure but more than cow manure. Cow and sheep manure have lower levels of nutrients so can be used near phosphorous-sensitive native plants such as banksias, grevilleas and waratahs. A hot compost is a great composting method if you have enough raw materials to build a cubic metre heap. You build the heap in one go and leave it to heat up and break down in under 6 weeks. Here is a link to show you how to do it. If you are using a compost bin purchased from a hardware which is between 200 to 400 litres this is not large enough to build a hot compost. Also for the home gardener who is continually producing small amounts of kitchen scraps you can’t really stock pile these until you have enough to build the hot compost heap. You would just end up with a stinky mess. That is why I prefer to use the system at the beginning of the article. This information is extracted from Kevin Handrek’s wonderful book, Gardening Down Under. This information shows us the key nutrients and how the plant makes use of the nutrient. The more diverse the raw materials added to your compost the most likely you are to provide these nutrients for your plants and if growing vegetables or fruit for yourself as well. Nitrogen is a key element in amino acids (the building blocks of proteins), in the genetic coding material of chromosomes and in many other important compounds in plants. For vigorous growth, plants need a steady supply throughout the growing season. Although air is 78% nitrogen, plants cannot make use of this nitrogen to make protein without the help of microorganisms or factories that convert atmospheric nitrogen into fertilisers such as urea and ammonium sulphate. Is essential to virtually every process taking place in a plant. It helps in the transfer of energy from sunlight to the plant and in providing the energy for many of the chemical reactions involved in growth and reproduction. Is an important part of the salts in the ‘juices’ of plants and is involved in the processes regulating the extension of stems. Potassium plays a major role in protecting plants from disease. It does this in part by promoting the development of thick outer walls in the outer cells of plants. Potassium deficiency leads to the accumulation of sugars and nitrate in plant tissues and it is these that provide much of the food for attacking organisms. Sulphur is a constituent of the essential amino acids cysteine and methionine, which are part of the genetic coding materials and proteins of all living things. Plants need calcium for normal cell division, as a component of cell walls, as a component of the salts inside cells and as part of the genetic coding materials. Calcium is vital for root growth. Is a key component of the chlorophylls, the green colouring materials of plants. It is therefore vital to photosynthesis. Is a constituent of many plant compounds that regulate and promote growth. It is especially important to the functioning of chloroplasts – the green parts of plant cells that contain chlorophyll and are the ‘factories’ of photosynthesis. It is essential to the functioning of key enzymes. It has a major function in photosynthesis. Essential constituent of a number of compounds called enzymes that are involved in many complex life processes in plants. The major role is in the production of auxins, which are plant hormones, which help control stem elongation, leaf expansion and the formation of roots. Is needed for the formation of cell walls in rapidly growing tissues. Boron deficiency reduces the update of calcium and inhibits the plants ability to use it. Is needed for the conversion of nitrogen gas from the air to soluble nitrogen compounds by bacteria and other soil organisms that nix nitrogen. Legumes therefore have a special need for it. It is also essential to the formation of proteins from soluble nitrogen compounds. Previous Are You Sharing Your Garden with a Funnel-web Spider?